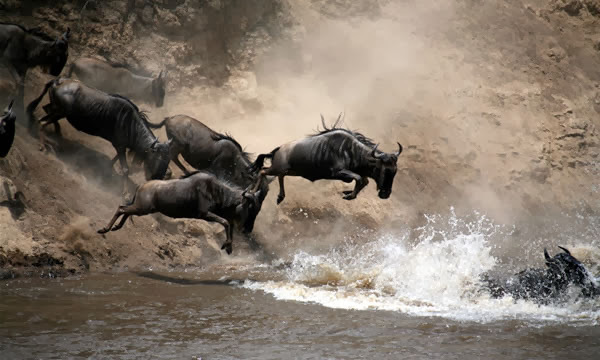 LETS GO TRAVEL KENYA (SAFARIS): And the migration is back! And the migration is back! On Friday we woke up to the news that the wildebeest migration in the Masai Mara were back! In a rare and dramatic shift, the wildebeest and zebra herds are reported to be back from northern Serengeti where they had moved to following some mid-season rains in October. The herds had presumed the time to relocate to the Serengeti had come, but local rains in the Mara ecosystem have changed that. The plains are now greened with fresh grass and luscious shots and it is our assumption that if the weather continues like this, there is a likelihood of wildebeest giving birth in the Mara like it was the case in 1998. Reports coming from the Mara indicate that the wildebeest are moving north of Mara Intrepids Camp through the Olare Orok Conservancy and across Posse Plain down to Sand River. The wildebeest and zebras are said to be everywhere, with crocodiles and other predators already enjoying their early Christmas feast! For Masai Mara bookings, contact us. Some nice information you have here.. I didn't know about this travel blog.. Will be visiting more often since I also write article on Travel Destinations (http://www.topratedtips.com/2013/10/here-is-why-nairobi-is-best-tourist.html)..